USF ATHLETICS GoUSFBulls.com FOR IMMEDIATE RELEASE Web Link: http://bit.ly/2PgiY4T MATCHUP: USF vs. The Citadel WEEKEND SCHEDULE: Thursday, 7 p.m.| Friday, 6:30 p.m. | Saturday, 1 p.m. LOCATION: Tampa, USF Baseball Stadium FOLLOW: Live stats |Twitter updates @USFBaseball RADIO LINK: BullsUnlimited WATCH: YouTube Bulls Face The Citadel for the First Time USF takes a break from league play with three against the Bulldogs TAMPA, April 17, 2019 – The USF baseball team steps away from The American slate, hosting The Citadel for three games beginning Thursday night. The Bulls (15-20) are hosting four non-conference games this week before finishing the final four weeks of The American schedule. USF fell to UNF Tuesday at home. Senior Kyle Phillips (Orlando) and freshman Julio Cortez (Miami) each had two hits in the game. Redshirt junior righty Dylan Burns (Vero Beach, Fla.) struck out a career high five in 4.2 scoreless innings out of the bullpen. Nota-Bulls · Senior first baseman Joe Genord (Lake Worth, Fla.) is third on USF’s all-time list with 42 for his career. He’s hitting a team best .339 with 11 home runs and 34 RBI. · Junior Jordan Santos (Tampa) is batting .343 in his last 10 games. · USF will go with the same weekend rotation as the last two weeks. Sophomore righty Baron Stuart (Okeechobee, Fla.) will start Thursday, junior righty Collin Sullivan (Randolph, Mass.) will start Friday and senior Alec Wisely (Jacksonville, Fla.) will get the call on Saturday. The Matchup This will be the first meeting between the Bulls and Bulldogs. USF took 2-of-3 from another member of the Southern Conference, Samford to open the year. Those Bulldogs currently lead the SOCON at 26-11 and 8-1 in league play. USF is 16-7 against current members of the SOCON. Know the Foe The Bulldogs (10-25) are led offensively by freshman infielder Tyler Corbitt, hitting .338 with 11 doubles and 25 runs. Sophomore Ben Peden leads the team with seven home runs and 29 RBI. The Citadel will start senior righty Jordan Merritt (3-4, 3.12 ERA) on Thursday, who leads the team with 51 strikeouts. Sophomore lefty Shane Connolly (3-3, 2.75 ERA) will start Friday, having tossed two complete games this season. Senior right hander Dylan Spence (2-6, 5.12 ERA). will start Saturday. Bulls Bits DID YOU KNOW? : USF has the only Division I coaching staff in the state of Florida in which every member was selected in the MLB Draft – head coach Billy Mohl (2006, Philadelphia); assistants Chuck Jeroloman(2004, Boston), Chris Cates (2007, Minnesota), Brian Jeroloman(2006, Toronto). The Bulls' coaching staff has a combined 25 years of playing experience in pro baseball. USF ATHLETICS GoUSFBulls.com FOR IMMEDIATE RELEASE Web Link: http://bit.ly/2VLvUBZ MATCHUP: USF vs. North Florida SCHEDULE: Tuesday, 6:30 p.m. LOCATION: Tampa, USF Baseball Stadium FOLLOW: Live stats |Twitter updates @USFBaseball RADIO LINK: BullsUnlimited WATCH: YouTube Bulls Welcome UNF Tuesday Night USF is looking for revenge after the March 19thloss to the Ospreys TAMPA, April 15, 2019 – The USF baseball team hosts North Florida Tuesday in the first of four home games this week. The Bulls (15-19, 2-10 The American) are looking to gain some momentum heading into the last month of conference play with the first of four non-league games this week. USF dropped all three at Tulane over the weekend in New Orleans. Nota-Bulls · Senior first baseman Joe Genord (Lake Worth, Fla.) hit two homers in NOLA and is now in third on USF’s all-time list with 42 for his career. He’s hitting a team best .342 with 11 home runs and 32 RBI. · Freshman Alex Bello (Miami) has a nine game hitting streak. · USF has been bashing during midweek games this year, hitting .319 as a team in seven contests. · Genord is clubbing .640 with three doubles, five homers, 11 runs and 12 RBI, slugging an absurd 1.360 in those games. Classmate Kyle Phillips (Orlando) is hitting .469 in those games and .322 on the year. · Redshirt sophomore Jake Sullivan (Tampa) is batting .355 over the last 10 games and junior Jordan Santos (Tampa) is batting .361. The Matchup The Bulls lead the series with the Ospreys, 10-8. The Bulls are 7-4 against UNF in Tampa and had won four-straight meetings in the series prior to March 19, when UNF won 7-2 in Jacksonville. Phillips, senior Garrett Zech (Naples, Fla.) and junior Austin Bodrato (Northvale, N.J.) all had two hits in the game. Know the Foe The Ospreys (21-16, 7-5 ASUN) have won five of their last six games. Jay Prather leads the ASUN with a .395 average and the team with 35 runs and 25 RBI. Trace Norkus got the start against USF on March 19, allowing just two hits with five strikeouts in 4.0 scoreless innings. Prather and Tanner Murphy each had three hits. Bulls Bits DID YOU KNOW? : USF has the only Division I coaching staff in the state of Florida in which every member was selected in the MLB Draft – head coach Billy Mohl (2006, Philadelphia); assistants Chuck Jeroloman(2004, Boston), Chris Cates (2007, Minnesota), Brian Jeroloman(2006, Toronto). The Bulls' coaching staff has a combined 25 years of playing experience in pro baseball. USF ATHLETICS GoUSFBulls.com FOR IMMEDIATE RELEASE Web Link: http://bit.ly/2Z26sdp MATCHUP: USF vs. Bathune-Cookman SCHEDULE: Wednesday, 6:30 p.m. LOCATION: Tampa, USF Baseball Stadium FOLLOW: Live stats |Twitter updates @USFBaseball RADIO LINK: BullsUnlimited WATCH: YouTube GAME NOTES Bulls Host Bethune-Cookman Wednesday Night USF defeated the Wildcats, 7-4, in extra innings on March 13 TAMPA, April 9, 2019 – The USF baseball team hosts Bethune-Cookman Wednesday in the second of three-straight home midweek contests. The Bulls (14-16, 2-7 The American) salvaged the War on I-4 weekend series in Tampa, taking the finale Sunday afternoon, 6-3. Senior Joe Genord (Lake Worth, Fla.) hit his ninth home run of the season, moving into fourth place on USF’s all-time list with 40 career homers. USF’s bullpen was outstanding during the series, allowing just one run on nine hits in 15 innings. Of the four arms used, three pitched at least four frames. The Matchup The Bulls and Wildcats will meet for the 70th time on Wednesday. The Bulls own a 61-17 edge in the series. USF is 12-7 against Bethune-Cookman in the last 19 contests since 2011. The Bulls defeated the Wildacts, 7-4, on March 13 in Daytona Beach. Genord matched a career high with four hits in that game, going 4-for-5 with a home run and two RBI. Classmate Kyle Phillips (Orlando) went 2-for-5 with a run. Junior righty Nelson Alvarez (Miami) pitched 2.1 innings and recorded all seven outs by way of the strikeout. Know the Foe The Wildcats (13-20, 6-6 MEAC) are led by three guys batting above .300. Nate Sterijevski leads the team with a .333 average. Senior Brandon Wilkes is second with a .322 average and 23 RBI. Joseph Fernando is third with a .317 average, six doubles and 21 runs. Righty Isaak Gutierrez will get the start for the Wildcats Wednesday. He’s 2-2 with a 3.21 ERA and 24 strikeouts, making his fifth start and eighth appearance. He tossed 5.2 inning getting the start on March 13, allowing three runs on four hits. Nota-Bulls · Junior lefty Noah Yager (Davie, Fla.) has tossed 21.2 innings over his last five appearances, surrendering 13 hits and just three runs with 18 strikeouts. · USF has been bashing during midweek games this year, hitting .319 as a team in six contests. · Genord is clubbing .652 with three doubles, five homers, 10 runs and 12 RBI, slugging an absurd 1.435 in those games. Phillips is hitting .481 and three other Bulls are batting above .310. Bulls Bits DID YOU KNOW? : USF has the only Division I coaching staff in the state of Florida in which every member was selected in the MLB Draft – head coach Billy Mohl (2006, Philadelphia); assistants Chuck Jeroloman(2004, Boston), Chris Cates (2007, Minnesota), Brian Jeroloman(2006, Toronto). The Bulls' coaching staff has a combined 25 years of playing experience in pro baseball. USF ATHLETICS GoUSFBulls.com FOR IMMEDIATE RELEASE Web Link: http://bit.ly/2Ua8qtC MATCHUP: USF vs. FGCU SCHEDULE: Tuesday, 6:30 p.m. LOCATION: Tampa, Fla., USF Baseball Stadium FOLLOW: Live Stats, Twitter updates @USFBaseball RADIO: BullsUnlimited WATCH: YouTube Bulls Welcome FGCU Tuesday Night USF hasn’t had a home midweek game since defeating No. 5 Florida on Feb. 19 TAMPA, April 1, 2019 – The USF baseball team hosts Florida Gulf Coast University on Tuesday in the first home midweek game since defeating then-No. 5 Florida on Feb. 19. The Bulls (12-14, 1-5 The American) are coming off of a tough home series against No. 11 ECU, dropping three to the first-place team in The American. Senior first baseman Joe Genord (Lake Worth, Fla.) hit .300 in the series with a double, a RBI and two runs. Redshirt sophomore Jake Sullivan (Tampa) batted .571 (4-for-7) with a RBI in two games. Senior catcher Tyler Dietrich (Naples, Fla.) had a season high three hits in the series finale on Sunday. The Matchup Tuesday will be the 17th all-time meeting in the series between the Bulls and Eagles. The Bulls got their first-ever win over FGCU in Tampa on March 13 of last year, a 10-3 victory. This week’s visitors hold an 11-5 edge in the all-time series. Genord is hitting .400 in three career games against the Eagles with a run, a homer and three RBI. Know the Foe Winners of five straight, the Eagles enter Tuesday at 19-8, 1-2 in the ASUN. FGCU leads the conference in hitting (.294), hits (275), scoring (8.0) and on base percentage (.406). Freshman Joe Kinker leads the ASUN with a .400 average. He has five homers, 24 RBI and 29 runs scored. Senior Jay Hayes is hitting .392 with six home runs and a league best 12 doubles & 31 RBI. Junior catcher Alex Brait is hitting .352 with a team high 30 runs. Junior left hander Trey Vickery will make his first start Tuesday. He’s 3-0 in 17.1 innings out of the bullpen with a 3.12 ERA. Nota-Bulls · 11 different Bulls have home runs this season. · Junior Jordan Santos (Tampa) is 19thnationally with 1 walk per game this year. · Genord is just one home run away from moving into fourth on USF’s all-time list. · Genord is batting .667 in five midweek games this year with four home runs, eight RBI and seven runs. · Senior Kyle Phillips (Orlando) is batting .476 in those five midweek games. Bulls Bits · DID YOU KNOW? : USF has the only Division I coaching staff in the state of Florida in which every member was selected in the MLB Draft – head coach Billy Mohl (2006, Philadelphia); assistants Chuck Jeroloman (2004, Boston), Chris Cates (2007, Minnesota), Brian Jeroloman(2006, Toronto). The Bulls' coaching staff has a combined 25 years of playing experience in pro baseball. Alex (Atascocita, TX): East Carolina had an excellent overall weekend with a sweep of UCF. And overall they are now playing rather well and have ran record to 18-6. But 11 of next 12 games are on the road, including trips to Houston and UCLA. How do you see them handling this difficult stretch? I think 8-4 is realistic. Based on how USF and Houston has played, I would not expect ECU to lose those series but winning at UCLA could be a very difficult task. I think taking one of those three would be a victory. Aaron Fitt: Yeah, this weekend was really the beginning of a very rigorous five-week stretch for the Pirates. Next two weekends are on the road at USF and Houston (both regional contenders, though they haven’t been great in the first half), followed by at UCLA and vs. UConn, with some tough midweek games sprinkled in between. Fortunately I think the Pirates are really finding their stride at the right time, and I expect them to play well against this stretch and climb into the top 10 in the rankings. I think they are a very good, balanced, experienced club that is playing with a lot of confidence right now. https://d1baseball.com/chats/college-baseball-top-25-chat-march-25/ I'm not the only one who still sees this team as a contender. I have tickets to give away for the weekend series, Saturday’s are going to one our member’s that asked earlier. Friday and Sunday are available on first come, first serve basis. I still have not found the time to fix our giveaway system, so I am offering two tickets to each game this weekend free to first to speak for them. Simply reply in this thread which day you want. Be sure your email address is in your profile so they can be transmitted. This includes tickets for tonight Please reply if interested. It's Bulls vs. Bearcats in an American Conference series. USF ATHLETICS GoUSFBulls.com FOR IMMEDIATE RELEASE Web Link: http://bit.ly/2Ftruu2 WEEKEND MATCHUP: USF vs. Cincinnati SCHEDULE: Friday, 7 p.m. | Saturday, 6:30 p.m. | Sunday, 1 p.m. LOCATION: Tampa, USF Baseball Stadium FOLLOW: Live Stats, Twitter updates @USFBaseball RADIO: 1040 AM & BullsUnlimited WATCH: BullsVision (Fri. & Sat.) |YouTube (Sun.) GAME NOTES Bulls Open Conference Play Home against Bearcats USF finished second during the regular season in The American last year with a 14-9-1 record TAMPA, March 21, 2019 – The USF baseball team opens American Athletic Conference action this weekend with a three-game series against Cincinnati. The Bulls (11-8) dropped a midweek tilt at UNF Tuesday night, 7-2. Seniors Kyle Phillips (Orlando) and Garrett Zech (Naples, Fla.) and junior Austin Bodrato (Northvale, N.J.) all had two hits in the game. Senior Joe Genord (Lake Worth, Fla.) hit .529 last week and was named to the American Athletic Conference Weekly Honor Roll for the second time on Monday. Bodrato had eight RBI in the series and is batting .343 over his last 10 games. There will be no changes to USF’s rotation this weekend. Junior Collin Sullivan (Randolph, Mass.) will start Friday, followed by senior Alec Wisely (Jacksonville, Fla.) Saturday and junior Ben Koff (Gainesville, Fla.) on Sunday. Wisely has gone 7.0 innings in consecutive outings and leads the team with a 3.18 ERA. The Bulls are 59-61-1 in league play over the five year history of The American. USF is 3-2 in AAC openers and 14-4 in conference openers since 2001. The Bulls finished second in The American last year with their best mark at 14-9-1. USF won three games at The American Baseball Championship in Clearwater last year, the first time USF won at least three games in a conference tournament since 2012. The Matchup The Bulls lead the all-time series against the Bearcats, 45-21. USF leads the series in Tampa, 24-6. The Bulls had won 15-of-16 in the series prior to dropping 2-of-3 from the Bearcats in both 2016 and 2017. The Bulls have won four of the last five meetings, including three-straight. Know the Foe The Bearcats (6-13) have one of the best fielding percentages in the nation (.980) and are second in The American with 28 stolen bases. Junior infielder Joey Bellini is batting .341, but with just 41 at-bats on the year. Sophomore outfielder Joey Wiemer is hitting .284. Senior righty AJ Kullman (0-3, 4.91 ERA) will start Friday, junior righty Nathan Kroger (1-1. 1.86 ERA) will start Saturday, and sophomore lefty Garrett Schoenle (1-0, 4.95 ERA) will start Sunday. Nota-Bulls · The Bulls are 25th nationally with 21 home runs. · 11 different Bulls have home runs this season. · Junior Jordan Santos (Tampa) is 24th in the country and tops in The American with 1.09 walks per game, leading the team and conference with 19. · Kyle Phillips hit .366 during conference play last season. · Genord is batting .348 entering the weekend and is third in the league with five home runs. Bulls Bits · DID YOU KNOW? : USF has the only Division I coaching staff in the state of Florida in which every member was selected in the MLB Draft – head coach Billy Mohl (2006, Philadelphia); assistants Chuck Jeroloman (2004, Boston), Chris Cates (2007, Minnesota), Brian Jeroloman(2006, Toronto). The Bulls' coaching staff has a combined 25 years of playing experience in pro baseball. USF ATHLETICS GoUSFBulls.com FOR IMMEDIATE RELEASE Web Link: http://bit.ly/2UJJg11 MATCHUP: USF at North Florida SCHEDULE: Tuesday, 6:05 p.m. 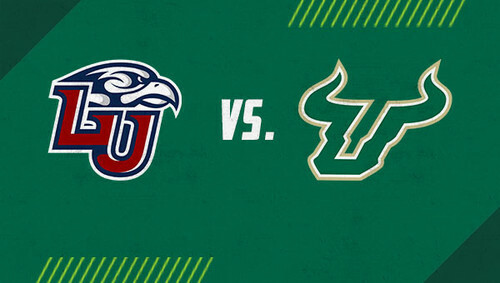 LOCATION: Jacksonville, Harmon Stadium FOLLOW: Live Stats, Twitter updates @USFBaseball RADIO: BullsUnlimited WATCH: ESPN+ GAME NOTES Bulls Travel To Jacksonville for Matchup with Ospreys Tuesday This is the final game before American Athletic Conference action begins Friday TAMPA, March 18, 2019 – The USF baseball team heads back to Jacksonville for the second time in the last week, taking on North Florida Tuesday night. The Bulls (11-7) swept their second weekend series of the year, taking three games against Dartmouth over the weekend. USF scored 27 runs and allowed just five in the three games. USF won, 16-1, on Saturday, tallying a season high 14 hits. The 16 runs matched the most for USF since scoring 19 in 2014. The Bulls scored 16 against Bethune-Cookman last season, also winning that game 16-1. The two 15-run margins of victory are the most since a 19-1 win over Penn State in 2014. Senior Joe Genord (Lake Worth, Fla.) hit .529 last week and was named to the American Athletic Conference Weekly Honor Roll for the second time on Monday. Junior Austin Bodrato (Northvale, N.J.) had eight RBI over the weekend against the Big Green. Junior right hander Ben Koff (Gainesville, Fla.) and lefty Noah Yager (Davie, Fla.) did not allow a walk in Sunday’s 4-1 win. It was just the third time since the start of 2018 that USF has not issued a walk. Righty Dylan Burns (Vero Beach, Fla.) will get the ball Tuesday in Jacksonville. He went a career long 5.0 innings last Wednesday at Bethune-Cookman in his second start. The Matchup The Bulls lead the all-time series with the Ospreys, 10-7. The Bulls are 7-4 against UNF in Tampa and have won four-straight meetings. Know the Foe The Ospreys are 13-9 on the year, leading the ASUN in hits, doubles and double plays. Senior infielder Jay Prather leads the offense with a .384 average, and he’s 11th nationally with 33 hits. He has 18 RBI and a team high 21 runs. Senior right hander Trace Norkus will get the start for UNF. He’s 1-0 with a 3.46 ERA and 19 strikeouts. Closer Eddie Miller is 13th in the country with five saves. He hasn’t allowed a run in 17.2 innings. Nota-Bulls · The Bulls are 16th nationally with 1.17 home runs per game. · 11 different Bulls have home runs this season. · Junior Jordan Santos (Tampa) is 29th in the country and tops in The American with 1.09 walks per game, leading the team and conference with 18. Bulls Bits · DID YOU KNOW? : USF has the only Division I coaching staff in the state of Florida in which every member was selected in the MLB Draft – head coach Billy Mohl (2006, Philadelphia); assistants Chuck Jeroloman (2004, Boston), Chris Cates (2007, Minnesota), Brian Jeroloman(2006, Toronto). The Bulls' coaching staff has a combined 25 years of playing experience in pro baseball. USF ATHLETICS GoUSFBulls.com FOR IMMEDIATE RELEASE Web Link: http://bit.ly/2CjrM4x MATCHUPS: USF at Jacksonville | USF at Bethune-Cookman SCHEDULE: Tuesday, 7 p.m. | Wednesday, 6 p.m. LOCATIONS: Jacksonville, John Sessions Stadium | Daytona Beach, Jackie Robinson Park FOLLOW: Live Stats – Tuesday | Wednesday, Twitter updates @USFBaseball RADIO LINKS: BullsUnlimited (Both games) WATCH: ESPN+ (Tuesday) GAME NOTES Bulls Play at Jacksonville and Bethune-Cookman In Midweek Contests USF plays the Dolphins on Tuesday and the Wildcats on Wednesday TAMPA, March 11, 2019 – The USF baseball team gets ready for a pair of midweek road games, first at Jacksonville at Tuesday followed by Bethune-Cookman on Wednesday. The Bulls (7-6) dropped a tough series to an 11-3 Liberty team over the weekend. The Flames had already defeat ranked programs like South Carolina and Wake Forest earlier in the season. Senior righty Alec Wisely (Jacksonville) had his best start in the second game against Liberty, tossing 7.0 innings to match a career high in a USF uniform. Wisely allowed just five hits and two runs (one earned), while striking out a pair. He was named to the American Athletic Conference Weekly Honor Roll on Monday. Junior Austin Bodrato (Northvale, N.J.) hit .444 with a homer, a double, two runs and two RBI. Junior right hander Ben Koff (Gainesville, Fla.) is making the start against the Dolphins Tuesday. He leads the team with a 1.38 ERA in 13.0 innings. Redshirt junior righty Dylan Burns (Vero Beach, Fla.) will make his second start of the year on Wednesday in Daytona Beach. The Matchup The Bulls and Dolphins have a long history going back to 1966, and Tuesday marks the 111th meeting. The Dolphins hold a slim 57-55 edge in the series. USF and JU split last season's series, both winning at home. The Bulls are seeking their first win in Jacksonville since 2007. USF is 60-17 against Bethune-Cookman all-time, having won 6-of-7. The two teams met in the Gainesville Regional in 2017 and split a pair of NCAA tournament games. The Bulls drubbed the Wildcats in Daytona Beach last season, 16-1. Know the Foe The Dolphins are 9-6 and on a five-game winning streak after sweeping Brown in a four-game series over the weekend. Senior infielder Angel Camacho is 14th nationally with a .462 average. He leads the team with five homers, 14 RBI and 14 runs. Junior infielder Dakota Julylia is second on the team with a .333 average, 12 RBI and 13 runs. The pitching staff in 19th in the country with a 3.33 strikeout-to-walk ratio. Nota-Bulls Senior Joe Genord (Lake worth, Fla.) leads the Bulls with four homers and is now fifth in program history with 35 career long balls. The Bulls are 24th nationally with 1.15 home runs per game. Junior Jordan Santos (Tampa) is 11th in the country with 1.25 walks per game, leading the team and conference with 15. Bulls Bits DID YOU KNOW? : USF has the only Division I coaching staff in the state of Florida in which every member was selected in the MLB Draft – head coach Billy Mohl (2006, Philadelphia); assistants Chuck Jeroloman (2004, Boston), Chris Cates (2007, Minnesota), Brian Jeroloman(2006, Toronto). The Bulls' coaching staff has a combined 25 years of playing experience in pro baseball. Free entry! All members! This is a ticket giveaway open to all site members. It is for two tickets to the Bulls Sunday vs. Liberty. Bulls vs. Liberty, Game 3 Sunday, March 10 1:00 p.m. USF Baseball Stadium Important: Tickets will be delivered electronically, you must have an email address in your profile. Tickets must be claimed within 24 hours or they will be withdrawn and re-distributed. Did I miss this or what's become of Graham Hoffman? He was supposed to be the co-closer for the Basebulls. He pitched the final 2.1 innings and struck out six to close out the Sunday game in the opening series vs. Samford and hasn't thrown since. Are we looking at another Tommy John? Free entry! All members! This is a ticket giveaway open to all site members. It is for two tickets to the Bulls Saturday vs. Liberty. Bulls vs. Liberty, Game 2 Saturday, March 9 6:30 p.m. USF Baseball Stadium Important: Tickets will be delivered electronically, you must have an email address in your profile. Tickets must be claimed within 24 hours or they will be withdrawn and re-distributed.